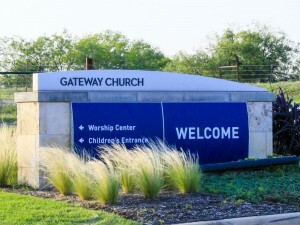 What's Going on at Gateway Church? There are some interesting things happening around Gateway Church, the fourth largest church in America. Some sources inside and outside the church think more changes are coming for the Southlake, TX megachurch. First, a brief review. I was first to report that Gateway Church planned to lay off as many as one-third of their staff and that the church was deep in debt. Gateway called this a “pruning” in preparation for growth. Apparently, the church is still in that season of pruning since the growth hasn’t come. Here are two new items. Pastor Robert Morris appears to be differentiating himself from Gateway’s brand. He is populating a slick website — pastorrobert.com — and is doing the same with his sermons on a separate Youtube channel. He also has a new radio brand with the Worship & the Word with Pastor Robert Morris product. It seems unnecessary to put the sermons on a separate page since they already exist elsewhere. Perhaps having content available on the church website and a separate website serves Gateway in some manner. It could also be a sign of Pastor Robert following the branding example of Pastor Mark (Driscoll). Time will tell. Two sources have told me that earlier this month during the Gateway staff meeting, it was announced that Robert Morris’ son Josh is going to plant a church in Austin, TX. While that may not seem like much to outsiders; at Gateway, it is a sea change. Numerous former members have told me over the years that Rev. Morris’ son is the apparent heir to the throne at Gateway. The younger Morris is an engaging speaker and knows the church intimately. It seems reasonable that he might step in as his father moves toward more of a “Pastor Robert” brand. However, just as Rev. Morris is moving content and products toward “Pastor Robert,” Pastor Morris the younger appears to be heading for the People’s Republic of Austin. It is hard to tell what to make of these items. Perhaps these moves are not related to the financial woes of Gateway. Whether or not they are related to the financial issues, it might be wise for members to ask how the church can afford re-branding and a church plant when other promised projects are on hold. Author Warren ThrockmortonPosted on September 19, 2017 Categories Gateway Church, Robert MorrisTags Gateway Church, Josh Morris, Robert MorrisLeave a comment on What's Going on at Gateway Church?